View the entire table of contents for the May 31, 1998 issue. May 31, 1998 Champagne Uncorked How good are the big-selling bruts, and why is French Champagne so special? By Jim Gordon As the economy continues to boom and the millennium fast approaches, wine lovers may drink more Champagne in the next 19 months than they usually do in several years. 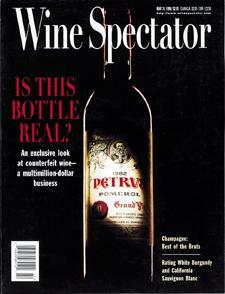 For the full article, check out the new issue of Wine Spectator, on newsstands May 31, 1998.